Global wealth is said to be increasingly concentrated in the hands of a small wealthy elite. According to a recent Oxfam study, the 80 wealthiest people in the world altogether own $1.9 trillion, almost as much as the amount shared by the 3.5 billion people who occupy the bottom half of the world’s income scale. Last year, that number was at 85, and in 2010 it was at 388 billionaires. Forbes has listed 1,645 billionaires out of which almost 30% of them reside in the USA. 20% of these billionaires seem to have an interest in finance or pharmaceutical/healthcare or are related to these sectors. An increase of 47% is seen in their collective net worth between March 2013 and March 2014. 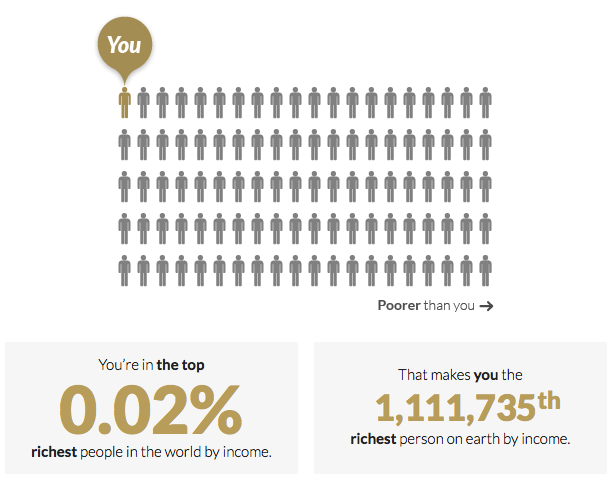 The world’s rich own a disproportionate share of its wealth, but what about you? Where do you actually stand in the rich list? If you haven’t made it on the Forbes Billionaires list, you might still be in for a shock. Check out your ranking on the world’s rich list using the great tool provided by the Global Rich List. Use either your income calculation or wealth calculation to put your financial situation in perspectives. To quickly see an example. lets look upon Mr. Mathew, an American with an annual net income of USD$500,000, and compare him to Mr. Alexander, a Russian with a comparable annual net income of RUB 34477500 (USD 500,000). Mr. Mathew is in the top 0.02%, making him the 1,111,735th richest person in the world by income. 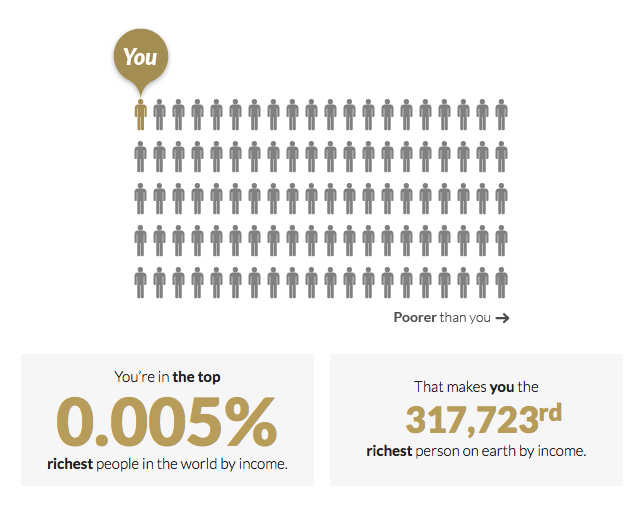 A similar calculation shows that Mr. Alexander is in the top 0.005% making him the 317,723rd richest person by income. This proves once again that money has different values in different countries. So where do you stand? See now at http://www.globalrichlist.com. My guess is that if you are reading this article, you are probably in the top o.01%.